High pressure provided us with quiet weather and some sunshine Sunday across Cleveland. But big weather changes are right around the corner. A cold front will arrive by Monday evening as an area of low pressure develops and moves up the east coast Monday night and Tuesday. This will set the stage for the potential for widespread snow for NE Ohio late Monday night and throughout the day Tuesday. 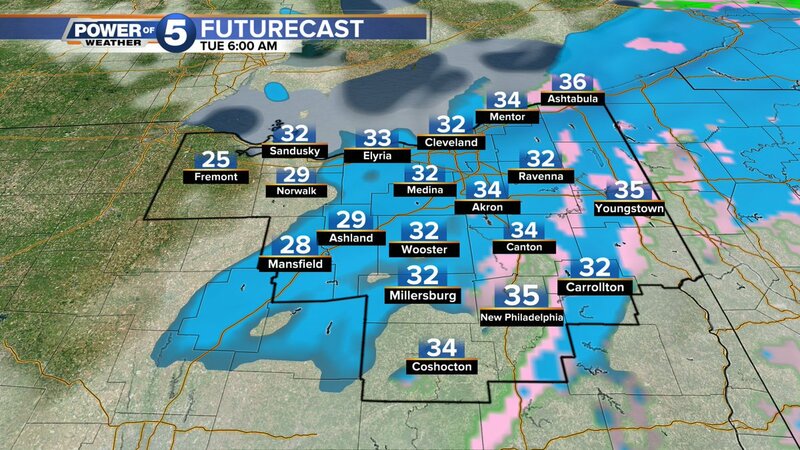 Snow will likely impact the Greater Cleveland area Tuesday and accumulation will be likely. Right now, 1-3 inches of snow appears to be a good bet for much of the area Tuesday. We expect scattered snow showers off and on through the day with temperatures staying close to freezing for much of the day. That means some slick spots could develop on some roads. Be extra cautious while driving around the Cleveland area especially Monday night and Tuesday. A few lake-effect snow showers may also develop on Wednesday. Overall, be prepared for multiple chances of snow this week and temperatures remaining about 10-20 degrees below normal for this time of the year.